Category: Bracelets. Tags: adrenal glands, bracelet, chest, forgiveness, heart, kidneys, love, lungs, peace, romance, rose quartz, trauma, trust, vertigo. 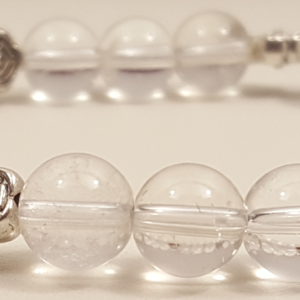 An elastic bracelet with rose quartz beads. 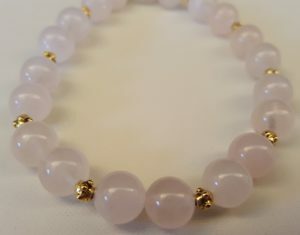 Rose quartz is known for its ability to awaken in the wearer unconditional love and a sense of great inner peace. 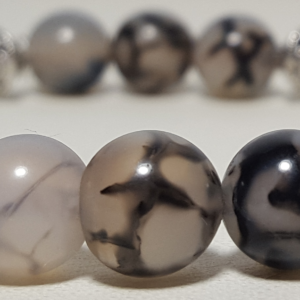 This stone shares its energy freely and generously, so much so that it sometimes needs to be recharged; you will know it is time to recharge it when its color changes from pink to almost white. To recharge your rose quartz, rinse in clear water and then place next to a clear quartz or a carnelian stone for 8 to 12 hrs. For the body, this stone is used to strengthen the health of the physical heart, chest, lungs, kidneys, and the adrenal glands. It has also been known to alleviate vertigo. For the mind, this stone helps with forgiveness and acceptance of self, others, and of difficult situations. It also helps increase self-trust and self-worth. For the spirit, rose quartz opens up the heart chakra and through the love revealed activates healing on all levels; it is essential for healing from traumas and crisis. Rose quartz is placed in the relationship corner of the room or house as a way to attract loving relationships. If looking for your romantic soul mate then place rose quartz next to your bed. Holding a rose quartz strengthens work with positive affirmations and setting of loving intentions.